I bought a little bag of Mom’s Apple Pie from the store purely because it smelled amazing. The dry leaf has this amazing apple cinnamon aroma that I love from apple pie, so I was pretty much sold on it as soon as I smelled it. 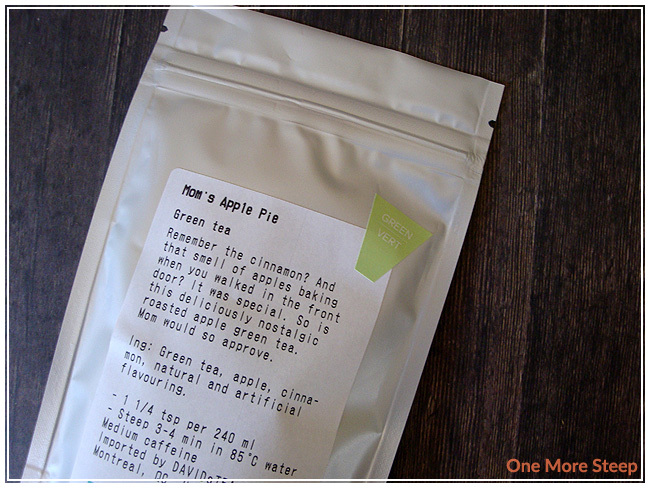 Mom’s Apple Pie is a green tea and the ingredients are: green tea, apple, cinnamon, natural and artificial flavouring. Mom’s Apple Pie is (yet another…) limited release tea, so if you’re interested in giving it a try now would be a good time. The tea itself has plentiful pieces of apple and cinnamon in with the green tea, which is nice to see. It has a great smell to it, definitely reminds me of apple pie. 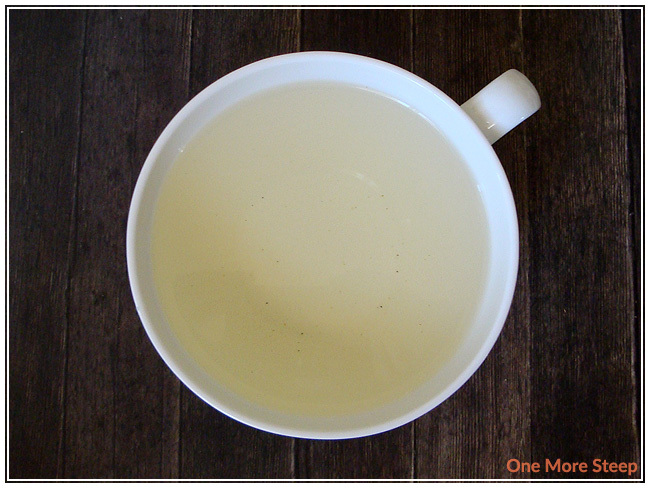 The problem with teas that come with flavouring is that it can often be lost when steeping, or when resteeping. DavidsTea recommends steeping in 85°C (185°F) water for 3-4 minutes. I steeped in my Tea For One pot for about 4 minutes. 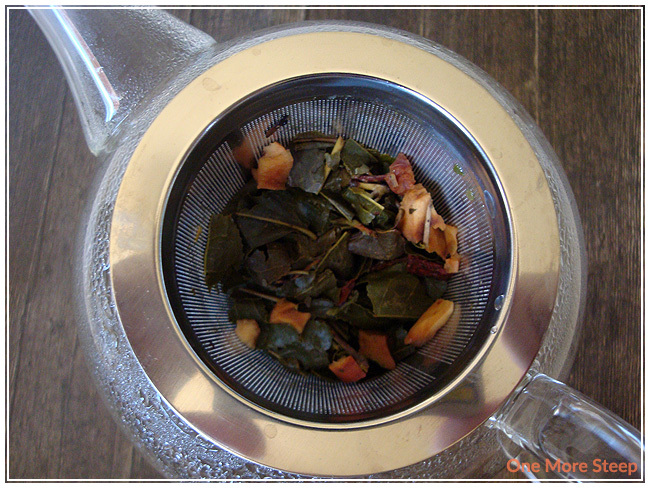 This tea has a beautiful smell when it’s steeping and after I pour a cup of it. It has a very rich apple cinnamon smell. The unfortunate thing is that the taste of apples is weak in the tea, and the cinnamon is fairly lost in the tea itself, which is disappointing because it is very much present in the smell of the steeped tea. I added a bit of sugar to my cup of tea and found that it brought out the taste of apples and cinnamon quite a bit, but it wasn’t enough to overcome my disappointment in the tea. I like trying green teas, and I’ve had good teas with apple in it before (Honeycrisp Apple is one that I wound up getting a whole tin of). Mom’s Apple Pie raised my expectations of itself because of the great smell it had, but the taste is just lacking. I attempted to resteep Mom’s Apple Pie but found that the weak apple taste was even more lost. I would not recommend doing one more steep with Mom’s Apple Pie. I didn’t like DavidsTea’s Mom’s Apple Pie. 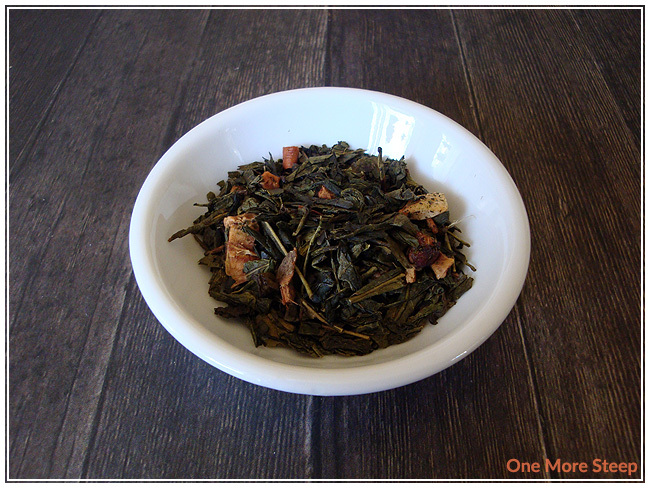 I found the smell of the dry leaf and steeped tea to be much better than the taste of the tea itself. The cinnamon was missing in the tea and the apple flavour was weak, I had high hopes for this tea because of how good it smelled, but I found it sorely lacking in flavour. I would definitely recommend adding a little sugar/sweetener if you’re going to give Mom’s Apple Pie a try because it does help bring out more of the flavours in the tea. Because of the disconnect between dry and steeped tea, I just had to give this tea one cup. I wanted to love it, because of how good it smelled, but there are much better flavoured green teas out there.